This article will give you some ideas on how you can manage your work across multiple levels, in this case we'll look at an example that crosses three levels; Strategic, Program and Project. What is managed on each level (and how)? On the strategic level the objectives/goals are managed, this are goals that span a few quarters or years. 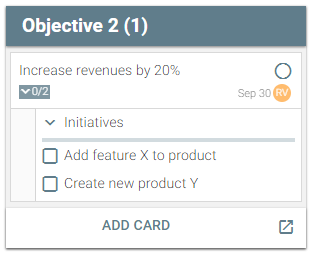 In this case a list is an objective (group), a card is a specification of the objective and the checklist items on the objective are the initiatives that are needed to meet the objective. The due date is used to set the end date for the goal, the assigned member is used to indicate who is responsible for meeting the objective. When you use ORK, Objectives will link to cards and key results will link to the checklist items. On the program level the different initiatives are tracked as cards (which will become different projects). Cards on the program boards are linked (mirrored) to checklist items on the strategic level. In this case a list is the stage of the project, that moves from Plan, to Run to Complete. 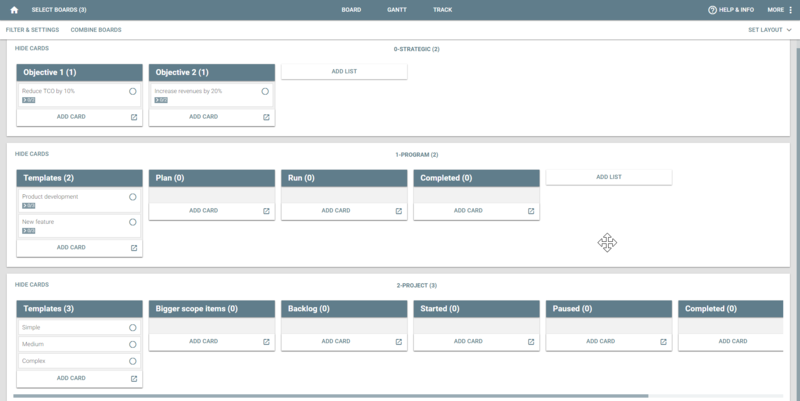 Lists are linked to card progress statuses to automatically update cards to Started in the Run list, and to Completed in the Complete list. This board has a list of templates that can be used when new cards are created, templates includes all card attributes and dependencies within the card itself. 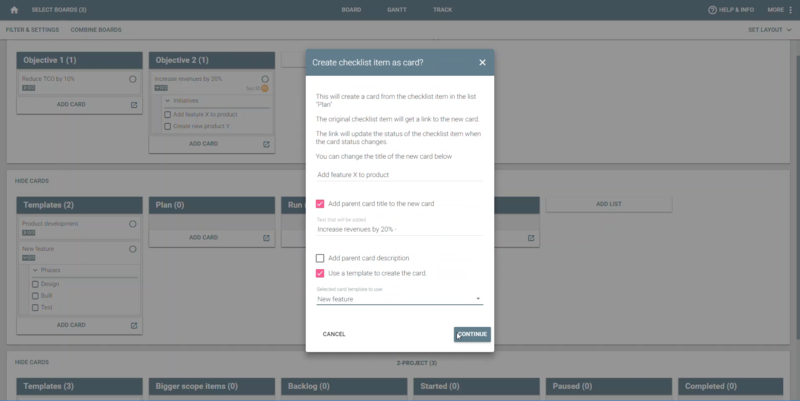 To create a card from the checklist item, you can simply drag the checklist item from the initiatives checklist to the list on the program board. To add the parent card title to the checklist item, check the first checkbox. To create the card from a template, check the last checkbox. This will create a card on the program board that is created from the template 'New feature'. The card is mirrored to the checklist item, which means that when the card moves to started, the item will be started and completed when the card is moved to the completed list. 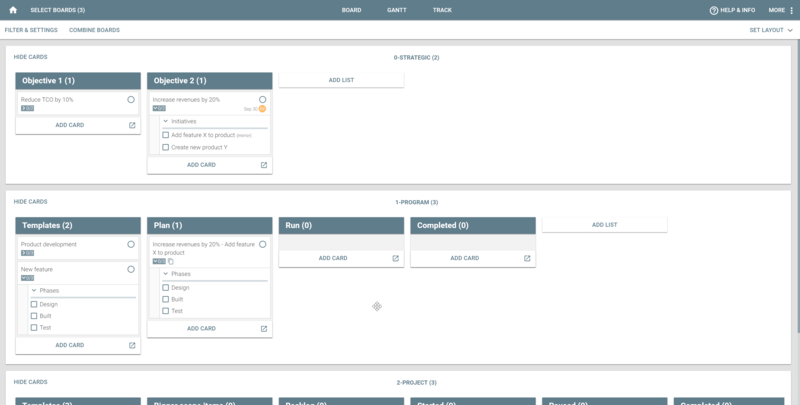 On the project level, project activities are created as card and tracked by the team members to completion. 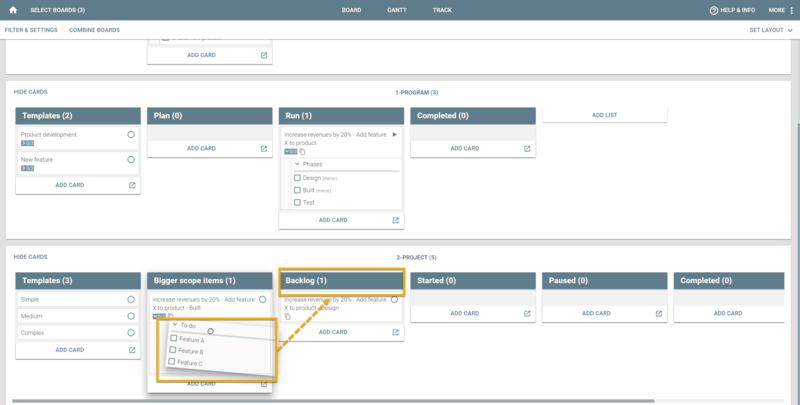 Cards on the project board can be linked to the checklist items on the program board. Card mirrors between the program and the project board are made in the same way as described in the section above. You'll like to create cards for activities that can be completed in 1/2 day to 1 day to avoid cards being stuck on started for to long. When there are bigger scope items, they can be parked on the 'Bigger scope item' list, then checklist items that are 1/2-1 day of work can be created as cards on the backlog board by dragging the checklist to the top of the backlog list (see below). Use the traffic light attribute on the card as a quick way to set the status of a card; Green = all OK, Amber = Something not ok but will manage and Red = Not ok, need help. Because the traffic light attribute is also mirrored, this will be an easy way to communicate the status up. Feel free to add new cards on each level, not all cards will be mirrored between levels and teams need to be able to add cards they need to manage the work so be flexible in how you handle this. 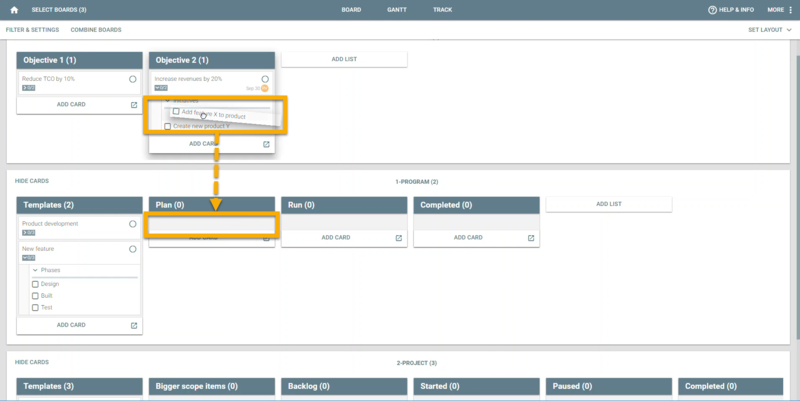 Create dashboards on each level to keep track of the status, you will probably review and discuss strategic objectives (bi)monthly, program status 2-weekly and project status daily. A dashboard that fits each level will help you to keep your focus on each leve.